This is my 500th Daily Farm Photo. What amazes me even more than reaching this milestone is something I discovered just last week. It seems that in the 11 months since I bought my new camera, I've taken nearly 8,000 photos. Eight thousand. I was so surprised. I had no idea I'd taken that many. Yep, there are quite a few you haven't seen (inlcuding an inordinate number of Cary pics of course). To see the 400th, 300th, 200th, & 100th photos, click here and here and here and here. If you would like to look back at more Daily Farm Photos, the easiest way is to scroll through the monthly archives via the links in the sidebar. And we out here in Internet Land are grateful for every single one you share with us. Thank you, FG! 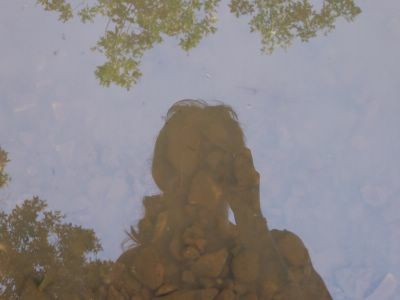 The puddle self-portrait is a great idea. Love the texture of the bottom of the puddle juxtaposed with your silhouette. I love the "self portrait" ... and my first thought is that its right up there with everyone needing to pull out the map and see you waving! Love that photo - congratulations on making 500! 500 Photos! Amazing. Congrats on reaching such a milestone. Congratulations on 500! I'm excited that I'm just getting close to 50 posts. And thanks for the thrill of getting a glimpse of you too. Nice pic! I love the whole reflection and mirror idea. Wow, that's a lot of photographs. No wonder you're so good at it! ...and I just found your blog today. You've got some amazing photos here. Beautiful. P.S. I found you via Miss Kitty. Congrats on 500 photos! I just love checking out your blog's pictures - beautiful! Congrat's on the 500th picture. I like the self portrait..it is reflective of yourself..lol. I can't see your long cotton dress in that photo. And where's your straw hat???? That's amazing. Happy 500th Photograph Anniversary! THANK YOU for all 500...you are one of the highlights of my day. Wonderful self portrait. What a fantastic picture to mark such a wonderful milestone. Thank you FG for all that you share with us. I absolutely love your blog - the pictures, the writing and the way you feel about using quality, organic ingredients. I have been enjoying your blog for a long time. Thanks for sharing.